(Nanowerk News) Today's light-emitting diode light bulbs have a slight environmental edge over compact fluorescent lamps. And that gap is expected to grow significantly as technology and manufacturing methods improve in the next five years, according to a new report from the Department of Energy's Pacific Northwest National Laboratory and UK-based N14 Energy Limited. "The light-emitting diode lamp is a rapidly evolving technology that, while already energy efficient, will become even more so in just a few short years," said Marc Ledbetter, who manages PNNL's solid-state lighting testing, analysis and deployment efforts. "Our comprehensive analysis indicates technological advancements in the near future will help people who use these lamps to keep shrinking their environmental footprints." New research from PNNL indicates light-emitting diode light bulbs, an example of which is shown here, are more environmentally friendly than compact fluorescent and incandescent lights. The report examines total environmental impact, including the energy and natural resources needed to manufacture, transport, operate and dispose of light bulbs. Fifteen different impacts were considered when evaluating environmental footprints, including the potential to increase global warming, use land formerly available to wildlife, generate waste and pollute water, soil and air. The report examines the complete life cycles of three kinds of light bulbs: light-emitting diodes, also called LEDs, compact fluorescents, or CFLs, and traditional incandescent light bulbs. Completed for the Solid-State Lighting Program of DOE's Office of Energy Efficiency & Renewable Energy, this is the first public report to examine the environmental impact of LED manufacturing in depth. Manufacturing processes contribute substantially to a light bulb's overall environmental impact, but companies generally keep manufacturing information private. The research team was able to gather manufacturing data with the help of industry consultants and some companies on the condition that the final report would not reveal individual company data. To do the analysis, the team chose specific bulbs that best represent what's most typical and widely available for each of the three types of lights they studied. They then used a database to calculate the resources needed to produce the various components of the three light bulbs. That analysis revealed both LEDs and CFLs are substantially more environmentally friendly then traditional incandescents, which consume far more electricity. For example, the specific incandescent light bulb the team studied consumes 60 watts of electricity, while the LED model they studied uses just 12.5 watts and the representative CFL only uses 15 watts to create the about same amount of light. "By using more energy to create light, incandescent bulbs also use more of the natural resources needed to generate the electricity that powers them," Ledbetter said. "Regardless of whether consumers use LEDs or CFLs, this analysis shows we could reduce the environmental impact of lighting by three to 10 times if we choose more efficient bulbs instead of incandescents." 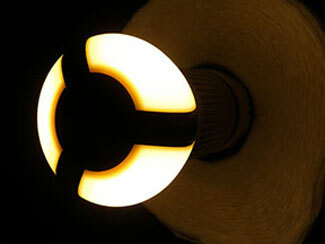 The energy consumed by lights when they're turned on makes up the majority of their environmental impact. But, with power consumption being similar between LEDs and CFLs when they are lit, the research team found the difference between those two bulbs' overall environmental performance is largely determined by the energy and resources needed to make them. CFLs were found to cause slightly more environmental harm than today's LED lamp in all but one of the 15 impact areas studied. The one standout area was generating hazardous waste that must be taken to a landfill. This is because LED lights include a component called a heat sink, a ribbed aluminum segment that is attached to the bottom of LED bulbs. Aluminum heat sinks absorb and later dissipate heat that's generated by the light bulb, preventing it from overheating. The process to mine, refine and process the aluminum in heat sinks is energy-intensive and creates several byproducts such as sulfuric acid that must be taken to a hazardous waste landfill. But soon, research and development is expected to further improve LED efficiencies, which in turn will reduce the amount of heat they produce and the size of heat sink they require. The research team found that this, and other improvements in manufacturing processes and electronics, will lead LED bulbs to be even more environmentally friendly than CFLs within five years. The team expects the LED bulb of 2017 will have 50 percent less environmental impacts than today's LED lamps and 70 percent less impacts that those found in today's CFLs, which are not expected to change significantly in the near future. Next, PNNL will examine the amount of hazardous materials that exist in LED, CFL and incandescent lights and whether those materials are present in levels that exceed federal and California waste disposal regulations. This and other DOE reports on solid-state lighting are available online at www.ssl.energy.gov/tech_reports.html.